1. 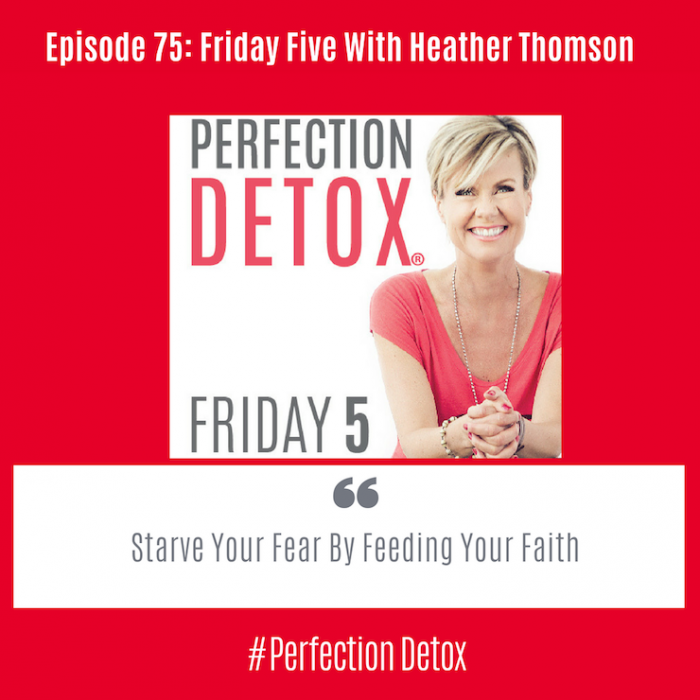 Heather mentioned that she “starves her fears by feeding her faith” and it is not that we will never feel fear, but what does it take so that we can do “it” afraid. I often reflect on what it takes to FEAR – Face Everything And Rise instead of FEAR – Forget Everything And Run. Is there something you have been putting off for the fear that is will not go as planned, go perfectly or perhaps even go better than you could imagine? – as that brings up a whole other level of fear. Think about one step you could take to help move you closer to being able to feel your fear and do it anyway. 2. Heather shared her thoughts on the adversity advantage and I do believe that it is not what happened to us that is the story – but how we react to what happens to us that will enable us to soar and shine. We all have things in our life that we wish had gone differently. Take a moment to reflect back lightly on a challenging time. Did it make you better or bitter? Do you view yourself as a victim or victorious? It is not always easy to see the good, and there is nothing wrong in taking the time to grieve and heal – and then it is important to release the negatives of your past so that you can cement and build your positive future. 3. A Masters In Heart & Hustle. Heather shared her unconventional backstory to success. Her Masters came from working in the fashion world instead of being in school. She talked about getting a foot in the door and the importance of constantly being open to learning. I often talk with people who feel that they don’t have “enough” credentials behind them to go for their dreams, and this is something I struggled with for many years. If you knew that you only needed to know a little more information than the people you want to inspire and motivate – would you already be out in the world sharing your message? 4. Heather is a big advocate of mentorship and talked about the importance of helping others rise as we travel our own path to success. Is there someone that you could reach out to mentor under? Someone who is already doing what it is you are wanting to do? Can you trade your time their information? Now look back and is there someone you could mentor? Someone who could help you with their time in trade for you sharing your tips and strategies for success? 5. Heather talked about the importance of knowing our light and being able to shine brightly and also how it sometimes will serve the work we are doing to allow those around you to take center stage. Technology is reducing our ability to being able to read a room and recognize what it needs. Emotional Intelligence is defined as the capacity to be aware of, control, and express one’s emotions, and to handle interpersonal relationships judiciously and empathetically. – EQ or emotional intelligence is just like a muscle, you have to use it or you lose it. Unfortunately, as we are all behind our screens so much it is something we can all use to cultivate and strengthen. Notice the next time you walk into a meeting, a party or just meet someone for the first time. Can you listen more than you talk and can you bring into the room what it is that people are hoping to find?